Contour, Detail or Feature Surveys: These surveys are carried out to provide both horizontal and vertical details over your land and are normally undertaken so that further construction work can be designed and constructed without interference to existing infrastructure. If instructing firstly have a look at those links relating to Survey Fees, Terms of Contract and Survey Methology. A DTM (Digital Terrain Model) is usually the digital result of such a survey, making it possible for other associated consultants to process the field information. Whilst reasonable effort has been made to locate all visible above ground services there may be other services which were not located during survey. This survey does not include a 'dial before you dig' enquiry. This survey is a detail survey undertaken to Detail accuracy. If detail information is required to an accuracy greater than general Detail surveys then the instructor should advise accordingly. For example, if wall or building locations are to be utilised for construction purposes, we should be advised accordingly. 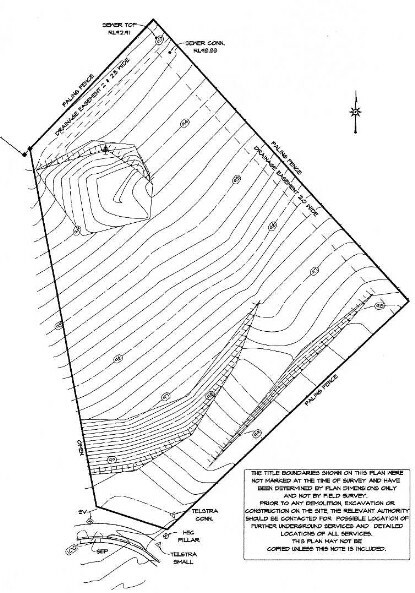 The title boundaries shown on this detail plan were not marked at the time of survey and have been determined by plan dimensions only and not by field survey. If strata subdivision over this site is contemplated all buildings resulting from the development must be within the title boundaries. A registered remark survey is recommended at this time. Services shown have been located where possible by field survey. Prior to any demolition, excavation or construction on the site, the relevant authority should be contacted for possible location of further underground services and detailed locations of all services. This plan may not be copied unless this note is included.